Ukraine is a country in Eastern Europe. It has an area of 603,628 k2 (233,062 sq mi), making it the largest country within Europe. Ukraine borders Russia to the east and northeast, Belarus to the northwest, Poland, Slovakia and Hungary to the west, Romania and Moldova to the southwest, and the Black Sea and Sea of Azov to the south and southeast, respectively. The territory of Ukraine has been inhabited for at least 44,000 years & is the prime candidate site for the domestication of the horse and for the origins of the Indo-European language family. In the Middle Ages, the area became a key center of East Slavic culture, as epitomized by the powerful state of Kievan Rus'. Following its fragmentation in the 13th century, the territory of Ukraine was contested, ruled and divided by a variety of powers, including Lithuania, Poland, Austro-Hungary, and Russia. A Cossack republic emerged and prospered during the 17th and 18th centuries, Ukraine remained divided until its consolidation into a Soviet republic in the 20th century, becoming an independent state only in 1991. Ukraine has long been a global bread basket because of its extensive, fertile farmlands. In 2011, it was the world's third-largest grain exporter with that year's harvest being much larger than average. Ukraine is one of the ten most attractive agricultural land acquisition regions. The country also has a well-developed manufacturing sector, particularly in aerospace and industrial equipment. Ukraine is a unitary republic under a semi-presidential system with separate powers: legislative, executive, and judicial branches. Its capital and largest city is Kiev. Kyiv is the capital of Ukraine. It is one of the oldest cities of Europe. 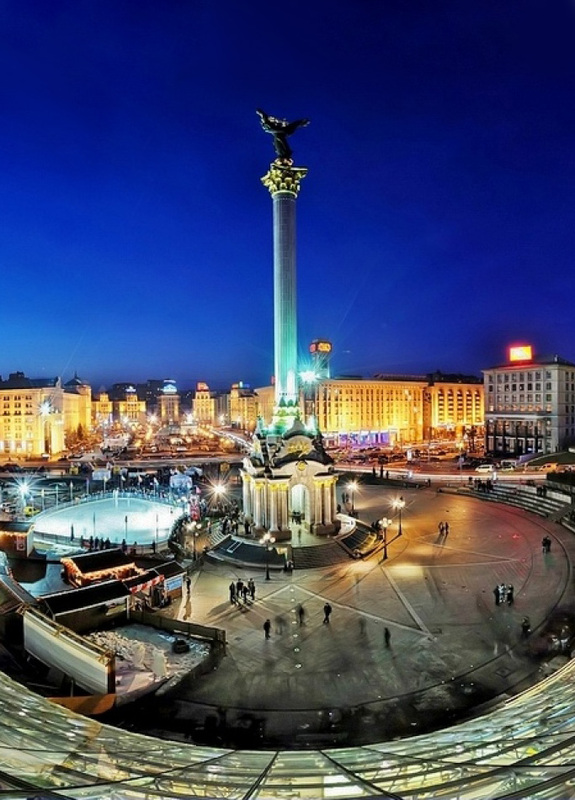 Kyiv is situated on the picturesque banks of the Dnieper River. Kyiv is a scientific centre. The Academy of Sciences of Ukraine and many research institutes are here. Kyiv’s cultural life is rich and varied. There are many theatres, museums, exhibitions in Kyiv. The ancient historical centre of Ukraine is Zaporizhzhia, the city in the southeastern Ukraine, situated on the banks of the Dnieper River. In the middle of the city is situated a pearl of Ukraine, the island Khortytsia, the cradle of Ukrainian Kozaks. Since the dissolution of the Soviet Union, Ukraine continues to maintain the second-largest military in Europe, after that of Russia, when reserves and paramilitary personnel are taken into account. The country is home to 45.4 million people, 77.8% of whom are ethnic Ukrainians, a sizable Russians minority (17%), as well as Romanians/Moldavians, Belarusians, Crimean Tatars, and Hungarians. Zaporizhzhia (0,7 million of people). Ukrainian is the official language of Ukraine; its alphabet is Cyrillic. Russian is also widely spoken. The dominant religion in the country is Eastern Orthodox Christianity, which has strongly influenced Ukrainian architecture, literature and music. Ukraine signed Lisbon convention on the Recognition of Qualifications concerning Higher Education in the European Region. Being also a member of the Bologna Process, Ukraine ensures high standards and quality of higher education qualifications. Ukraine is the best platform for higher education among the Eastern / Central European countries. Foreign students from more than 144 countries of the world undergo training in the higher educational institutions of Ukraine.